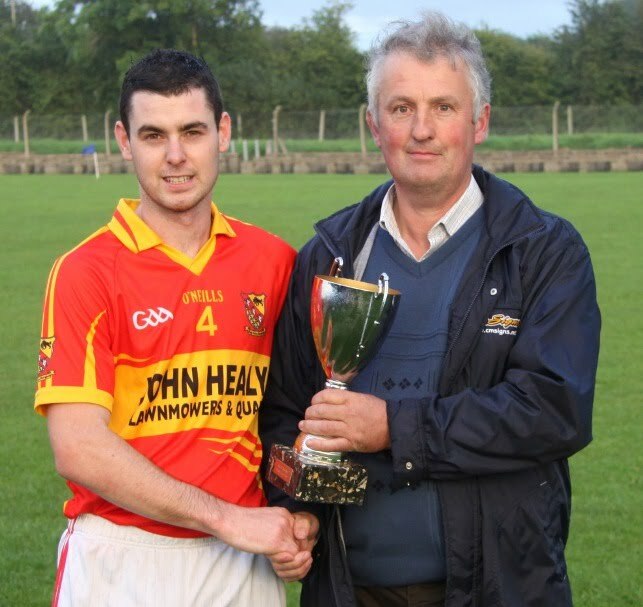 Moycarkey-Borris enjoyed a six-point win over Moyne-Templetuohy in Holycross on Sunday evening and thereby claimed the Mid Tipperary junior B football title. Throughout this encounter Moycarkey-Borris looked the more accomplished footballing outfit. Indeed, Moycarkey-Borris had strode into a deserved 2-8 to 0-5 lead by the 42nd minute, but then elected to ease up and let a hard-working Moyne-Templetuohy side battle their way back into contention. The Moycarkey-Borris advantage was never seriously threatened, but the management team will need to address the issue as the Mid champions now prepare for a county semi-final. For Moycarkey-Borris Robert Clancy was dominant at full-back, centre-back Philip Kelly looked an excellent footballer as did wing-back Pat Molloy. Conor Hayes caught the eye at midfield while the combination play of Robert Doran, Peter Kinnane and Eolan McCarthy wreaked havoc up front. For Moyne-Templetuohy Theo Lloyd, Shane Fogarty and the determined Martin Kelly led the line as effectively as they could. A right-footed Robert Doran effort opened the scoring in the tenth minute before Moyne-Templetuohy’s Eoghan Franks levelled matters two minutes later. Rory Regan and Martin Kelly (free) then traded scores before a lovely Kevin Moran point in the 23rd minute handed Moycarkey-Borris a narrow lead (0-3 to 0-2). Two minutes later a Martin Kelly free levelled matters once more. Moycarkey-Borris then struck for a crucial goal in the 29th minute - Peter Kinnane’s initial effort was blocked but Robert Doran was on hand to slot home the rebound. Kinnane, following a flowing move, landed a lovely right-footed effort in the 31st minute and Moycarkey-Borris led 1-4 to 0-3 at the break. Moyne-Templetuohy had spurned a glorious goal-scoring opportunity in the 20th minute when Eoghan Franks stinging effort was blocked by Peter O’Brien and now had it all to do against the elements in the second half. To their credit Moyne-Templetuohy began the second half in enterprising fashion with a terrific right-footed effort from Martin Kelly cutting the deficit to three points. Moycarkey-Borris responded in kind however with an Eolan McCarthy free restoring the four-point advantage before his side struck for their second goal in the 36th minute - following an expert lay-off from Peter Kinnane William Dempsey’s surging run was brought to an unceremonious end and Eolan McCarthy stroked home the resultant penalty. More terrific combination play set up Peter Kinnane for a fisted point in the 37th minute and Moycarkey-Borris led by an impressive eight-point margin (2-6 to 0-4). Martin Kelly (free) managed a response for an obviously unsettled Moyne-Templetuohy team before wing-back Pat Molloy intercepted a ball, strode forward and kicked the point of the game in the 40th minute on behalf of Moycarkey-Borris. A minute later Moycarkey-Borris were raiding once more, but this time Moyne-Templetuohy ‘keeper Liam Ryan conjured a brilliant save to deny Eolan McCarthy a certain goal. Then, in the 42nd minute, Peter Kinnane kicked his side’s eighth point of the evening. Strangely Moycarkey-Borris now seemed content with their evening’s work and Moyne-Templetuohy charged back into contention. Between the 48th and 57th minutes four consecutive Martin Kelly frees cut the deficit to five points (0-9 to 2-8) before a smashing solo effort from Robert Doran concluded the scoring in the 59th. Moycarkey-Borris: Timmy Ryan, Jamie Fanning (captain), Robert Clancy, Peter O’Brien, Joe O’Sullivan, Phil Kelly, Pat Molloy (0-1), Kevin Moran (0-1), Conor Hayes, Ailbe Power, Robert Doran (1-2), Rory Regan (0-1), Eolan McCarthy (1-1, 0-1 free, 1-0 penalty), Peter Kinnane (0-3), William Dempsey. Subs: (46th) Aidan Maher for William Dempsey, (56th) Gary O’Connell for Peter O’Brien, (61st) Conor Bourke for Conor Hayes. Moyne-Templetuohy: Liam Ryan, Eddie Everard, Tim Bergin, James Maloney, Robert Larkin, Liam Butler, Mark Kelly, Colm Everard, Simon Everard, Eoghan Franks (0-1), Theo Lloyd, John Butler, Martin Kelly (0-8, 0-7 frees), Shane Fogarty, Enda Everard. Subs: (10th) Michael Ryan for Enda Everard, (HT) Diarmuid Fogarty for John Butler, (44th) Donnacha Dunne for Eoghan Franks, (44th) Eoghan Ryan for Mark Kelly, (50th) Paul Quinlan for Theo Lloyd.